What a wonderful & relaxing experience! Breathing better & feeling well after my first experience; can’t wait to return. A very tranquil setting allowing for total relaxation, and health benefits are an additional bonus! 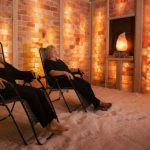 Salt inhalation is an amazing mucolytic, detox and relaxation modality, and this place has a grounding, therapeutic vibe and an awesome owner! We recently booked a group session at this salt cave – what a gem! We have visited other salt caves in Asheville, and this far surpassed any other experience we have had. The décor is perfect for relaxing. Every detail has been thought out. The cave is a calm oasis, and you feel transported right to Nepal. Chrissy, the owner, is very welcoming and extremely knowledgeable about the benefits of salt therapy. My mom has a monthly membership and is seeing great improvement with her asthma and respiratory issues. Just left after my first visit. Sinuses open. Very therapeutic and peaceful. Highly recommend. A wonderful experience! I love that it helped my husband’s respiratory problem and he felt much better the following morning. Himalayan salt is good for so many things (and even just for relaxation purposes). The owner is very knowledgeable and can answer any questions you may have. And the décor and ambience bring a bit of Nepal close to home. It was a magical experience. The cave was like a salt womb. I felt rejuvenated. The owner is extremely welcoming and makes you feel right at home. It will be a definite stop for me every time I am in Winston-Salem. If you’ve never been to a salt rock cave, do yourself a favor and check this out ASAP! I just came out and feel like I’ve been relaxing on the beach for two days without the sunburn! And its only $25 (introductory rate). So much easier than a beach trip! Himalayan salt has incredible healing properties. Do some research if you are skeptical. Thanks, Chrissy, for opening the Triad’s first and only Himalayan Salt Cave. I’ll be back at least monthly! A great way to unwind. This place is uber cozy and relaxing, with all sorts of blankets and pillows. You can hang out in a zero-gravity chair or lie right on the salt-covered floor. I just love meditating on the “stars” and “mountains”. Give it a try. There are so many health benefits. We had a great retreat for our girls’ weekend! We weren’t sure what to expect, but we left relaxed and refreshed! The owner is very welcoming and easy to work with and has paid attention to every detail! We are so excited that you brought a little piece of the Himalayan Mountains to Winston-Salem! Not only do you reap the health benefits, but you also come away feeling very relaxed. Looking forward to a return visit. Chrissy is so welcoming and informative. This place feels like an escape. My son has been running a 102+ degree fever since Saturday, so I decided to take him there today to see if it would break down this infection he’s got somewhere. I just had nose surgery 3 weeks ago, and I have been super swollen in the face and congested. Let me just tell you, the swelling is GONE, and the fever is GONE. My son and I have felt so much relief it’s INSANE! I have done everything for two days to get rid of his fever and I’ve taken so much Tylenol to get my swelling down, and after just 45 minutes in the salt cave, it’s gone. Please go check out this place. You will honestly will not regret it! I had my first salt cave experience yesterday! I must say it is very relaxing and I could feel health benefits immediately. Thank you, Chrissy, for making us feel so comfortable! I look forward to coming back soon. BTW I love my salt lamp!! Amazing! I would definitely go back. So relaxing! I absolutely loved it and didn’t want to leave. Relaxing before and after. Being served hot tea was fabulous. I’ll be back! This is a hidden gem! It’s like being whisked away to an exotic land of healing for body, mind and spirit. I had never heard of Himalayan salt caves, but after our first visit, my friends and I are already planning to go back again and again! We visited at a time when we had the cave all to ourselves. Although we started out relaxing in the lounge chairs, before long we were all sitting directly on the salt-pebble floor, covering our hands, legs and feet with the salt pebbles and laughing like little kids at the beach! It just feels wonderful in the cave! The results were astounding! My friend, whose feet were very swollen due to a medication, began to talk about the swelling going down within just a few minutes. Within about 30 minutes, they were back to normal! After our session, my other friend, who has had problems with balance and walking since having a stroke, was able to stand unassisted and even walk over 100 feet without help! I have had problems with arthritis in my feet, knees and hands. My entire body felt better after our experience at the Himalayan Hideaway Salt Cave. I’m in my 60s, so that’s saying a lot! Relaxing afterwards with tea in the Nepalese Tea Room was the perfect way to top off our experience. We could feel the healing continue while using the detox foot domes. It was also fascinating chatting with and learning from the owner, Chrissy, and we simply did not want to leave! My friends and I all agreed that this is not just a wonderful way to spend an afternoon; it’s an amazing experience that reveals a new hope for redirecting and enhancing healing in your life! I am very proud of Chrissy Klunder for bringing Nepal to Winston-Salem!!! The place is beautiful, and the services meet market needs. It’s a great addition to our community. Went for a visit today. Very impressive and would definitely recommend. I will make many trips back. Thank you. Went here during opening week. It was so relaxing, and I could have stayed a couple of hours. Clean, warm and salty. I feel relaxed. May need to be a Friday appointment stop. Planning to go back again next week! This was absolutely an amazing experience. The ambiance of the place made me feel as if I was in Nepal. The cave held on to the freshness of the air, and the salts felt great under my feet. I haven’t felt this relaxed in a while. I will definitely go back. I had a wonderful first session today and the swelling in my feet went down within the first 10 mins. I will definitely be going back for more sessions. Thank you, Chrissy! 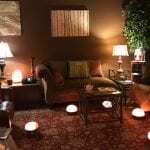 We highly recommend Himalayan Hideaway Salt Cave in Winston-Salem as an avenue towards your total health and wellness! From the moment we stepped through the front door, we felt like we were teleported to another world. My family has been to Nepal, and what’s before us is so reminiscent of the scenes in Nepal. The owner, Chrissy, took the time to explain to us all about Himalayan salt—its history and benefits, its pervasive use in Europe for decades, and its current trends in America. If we had arrived 15 minutes before our session, we could have had some tea back in the tea room, but having cut it close to the top of the hour, we put on our booties and were ushered into the salt cave room straight away. Oh, what a beautiful place. So transforming and inviting, like we had just arrived at the foot of Mt. Everest! Words won’t do justice in describing this “cave”; you just have to go and experience it. And again, our hostess patiently explained to us what we could do in the cave (pretty much anything we want to, without intruding on the other guests’ pleasure) and what would happen during the 45-minute session. My wife sat right down on the “beach” and buried herself in the salt pebbles. My daughter laid down on a blanket on the “beach” and stretched out. I couldn’t decide, so I tried several things. First, I sat down in the corner by the “campfire” and dug my feet down to the heating pad. It didn’t feel very warm but when I left it and walked on the beach, then it was apparent that the beach was colder. Next, I stood by the generator where the salt micro-particles were pumped in to “get the full effect.” I breathed deeply and could taste saltiness on my lips. As the lights were turned down gradually, I then sat down on one of the zero-gravity chairs, kicked back and just relaxed. I must have drifted off to sleep because the next thing I realized was the generator turning off. Wow, that went by so fast and was so relaxing. Our hostess invited us to stay for tea in the tea room in the back. And it’s another gorgeous room– so inspiring and well-appointed for relaxation. Cushy couches with lots of pillows and adorned with Himalayan décor. We were served a wonderfully refreshing Nepalese tea—not too strong or weak, just a nice medium-bodied tea you can drink straight up. There were several salt lamps on the floor that we could lay our feet on. What a marvelous way to extend our relaxation and healing! So what were the effects of this halotherapy on us? My daughter was fighting a cold and congestion; she said crud came up while she was in the session, and she could breathe well afterwards. I had been bogged down by allergies; I didn’t feel any difference right away, but started to breathe better on the drive home. That evening I was energized when usually I would be tired. That night and a couple of nights after, I was able to sleep well and breathe unobstructed. My wife said she breathed better and had more energy afterwards. Alas, the effects only lasted a few days. I’m thinking that the best deal is to get an unlimited month-long pass; that would be the most cost-effective way to get the wellness benefits of halotherapy on a consistent basis. Unbelievably relaxing . . . a trip to Nepal without leaving Winston-Salem. It’s beautiful; it’s peaceful; it’ll make your day! Go! Then go again!!! Fantabulous morning spent here. I loved it so much and will definitely be back. Being a caregiver, I needed to relax in a stress-free place, and the cave is perfect. I absolutely LOVE Himalayan salt! This cave is a breath of fresh air– literally. And right here in Winston-Salem? Yes, yes, yesssss!!!! WOW!! What a great place!! LOVED it!!!!!! !